← OPCW on Salisbury poisoning – one step forward, two back? This entry was posted in Russia, science and tagged Barezh, chemical weapons, Damascus, France, missiles, Syria, UK, USA. Bookmark the permalink. A radio interview with Robert Fisk, who has just visited the clinic in Douma, and spoken to a Dr there. here is another more expensive report from an American source on the ground in Douma. Thes reports are not getting into our mainstream media to any extent. Perhaps the truth is slowly getting through. How are the FUKUS going to spin this one? Not at all. Last night on Hardball, Chris Matthews, of MSNBC, which I would consider Mainstream Media, asked the question that you have failed to ask. Why were there no casualties from the 150 U.S. missiles which supposedly hit their targets? David, I can not see the point of your comment. But as for your question about casualties. There were about 103 missiles. No deaths, several injuries. Three locations were destroyed – empty and containing no chemical weapons so people in the area not harmed. (Although the lairs in London, Washington and Paris described then as chemical weapons factories and storage areas. My post above, and the lack of casualties, surely shows that to be completely untrue). I do not believe FUKUS wanted any casualties in Damascus – I believe they knew there were no stocks of chemical weapons at the Barezeh Scientific Research Centre. I find it impossible to believe their intelligence sources did not include anyone capable of reading OPCW reports on Syria. The Russian MOD have given details which differ from those provided by the US. According to them there were several airfields and bases also targeted but none of those missiles got trough. According to the Russian MOD, about 70% missiles were destroyed. That seems high to me considering that the Syrians do not have modern anti-missile systems (the Russians are now considering supplying them with the S-300 systems). But it could be true if (as is likely) the Russian military provided continual information on the missile paths and likely targets. If these airfields were targeted then I expect FUKUS was prepared for a small number of Syrian military casualties – not civilians. One aspect which makes me suspect the Russian MOD are telling the truth and the US military is telling lies is that the US claims seem completely unrealistic. They claim 70 missiles were aimed at the Barezeh Scientific Research Centre. 70 missiles for 3 buildings. Come on. They also claim that all missiles reached their targets. Yet video recorded in Damascus actually show missiles being hit by the Syrian anti-missile systems. I have heard that either 5 were shot down or 5 got through – can’t remember the specifics. But there were definitely casualties. The first one – I mention at the beginning of my article, is the truth. FUKUS and our mainstream media have told outrageous lies – particular about the Barezeh Scientific Research Centre. They have absolutely no morality and are showing an absolute disdain for the work of the OPCW in their lies. I think this specific example shows how unwise it is to rely on the mainstream media, which simply used the same terminology as that provided by the US, has ignored completely the reports of the OPCW and, even now, when social media and alternative media are providing the OPCW reports, our mainstream media continues to hide these facts from us. Did MSNBC actually report the truth about Barezeh Scientific Research Centre? If not, why not? But the lies continue. FUKUS and our mainstream media are really pissed off that the area of Douma where the alleged chemical attack occurred has been liberated. OPCW inspectors are now working there and they spent the last few days interviewing 22 medical staff from the hospital in one of the White Helmet’s videos. So the UK OPCW representative distorted the information in the president’s report to claim that Syria and Russia are preventing access. The US delegate publicly claims that the Syrian and Russians are destroying evidence. They are preparing us, and the media, to discredit the OPCW findings. Anyone following social media will have seen how the pro-FUKUS bots swung into action earlier this week to promote this fake news. The Guardian has now gone so far as to claim the evidence provided by the medical staff was taken under duress!! Of course, relying on reports by terrorist-linked activists for this claim. Bloody hell. In the chemical attack in Khan Shaykhun last year these people simply accepted the reports from the terrorists. They never questioned the fact that these terrorists would not allow the OPCW or UN JIM team to visit the site and collect samples. And they simply used social media reports from the terrorist organisations – and samples provided by the terrorist organisations. As I keep saying, We should not wear blinkers and should not impose on ourselves self-censorship. The media simply cannot be trusted. And why haven’t you discussed these in your many lengthy essays about unjustified biases against the Syrian regime? David, what a pathetic lie. I have never justified any crime against humanity – in fact, I have for a long time been fighting such crimes. And there are plenty in Syria committed by the head choppers who are financed and armed by the NATO powers. Odd. Fighting such crimes? I have never seen you write against the crimes committed by the Assad regime. Could you please provide an example where you have fought against the crimes committed by the Russian backed Syrian regime? I guess your retreat to unspecificity derives from the absolute disaster of the US/NAT/Terroirist/WQhite Hlemtys claim of a chemical weapons attack in Douma. On the face of it, this seems rather stupid for the head choppers to create such a false flag incident just before the territory is liberated and journalists can actually get in to check out their story. Not to mention that for the first time the OPCW can actually investigate on the ground instead of relying on White Helmets propaganda. And is not the FUKUS missile attack completely illegal. And their claims of chemical weapons targets a complete lie? 1.) I don’t justify Assad’s crimes. They are unjustifiable. 2.) I don’t believe he has committed any crimes. This is more fake news. Liberated. That is an interesting word. I’ve seen you use it before in describing the Assad regime’s military efforts. Assad is “liberating” the area, his people. Perhaps my first interpretation of your response was not correct. Perhaps you are a devotee of the unique philosophy that “Life is the disease of the Universe.” And Assad is just cleaning things up. David – you did lie. It makes no difference that you put a ? at the end of the sentence. Yet, you know you cannot find a single instance where I have justified a crime against humanity – far from it. The fact that the perpetrators of these crimes against humanity are your head chopper fiends is not “whataboutism” at all. There are plenty of instances of those crimes – which you completely ignore. But you have never presented to me a single instance of a crime against humanity committed by the “Assad regime” which I have responded to with a justification. None at all. And, of course, you remain completely silent about the crimes committed by the FUKUS regimes with their missile attack. And their complete lies in describing a research institute as a chemical weapons factory – something they knew themselves to be completely wrong. Your attempted reversion away from the crimes committed by your friends is a blatant case oif “whataboutism”. The Syrian comedian Treka shows how your objection to the liberation of his fellow citizens from the terrorists is farcical. Sure. Fine. So we can all get on with our lives and avoid further diversions from you, if it makes you happy I lied when I asked you how you can justify Crimes Against Humanity committed by the Assad regime. Does that mean you DON’T justify the Crimes Against Humanity committed by the Assad regime? If that is what you mean, please say it. Otherwise I will be forced to “lie” again and conclude that you do indeed justify them in some way. PLEASE GIVE ME YOUR EXPLANATION FOR THE CONTENT OF THESE LINKS. Do you justify the atrocities presented here? That is a question. It is not an accusation. Don’t put words in my mouth again! You know what, on second thought I didn’t lie. You HAVE justified these abominations by saying that Assad is “Liberating” these people. If you want to call this murder “liberation,” then you are justifying it. So, David, you are defining the liberation of people who have been kept imprisoned in these enclaves as “murder” and a crime against humanity? Really? Show me how you can support such a stupid statement for Aleppo or East Ghouta – these liberations are recent, there is plenty of information available and testimony from the people who have been liberated. Really, somewhat who is that obsessed with supporting these head choppers that they would make such claims are beyond help. You are just not being at all rational. Response: No. 11,000 murdered. 250,000 imprisoned. Didn’t you look at the links I provided? It might help if you knew what you were talking about. And YOU are the one who is defining these atrocities as “liberation.” I’m not using that word to describe the actions of the Assad regime. YOU are. Response: I see. So in your mind, crimes against humanity are ok as long as you can show the lives of other people have been improved. That must have been what the Germans were thinking in the 1930s & 40s. Response: I’m not obsessed with these head choppers. I’m obsessed with getting you to admit that you are neither fair nor balanced in your approach to this situation. You, this blog, is the “Alternative Media” that you so highly tout as presenting Truth. You are the one who has condemned the Mainstream Media as being one sided . . as being Fake News. You’re no better. In fact you’re worse. I am obsessed with making you look at your own hypocrisy. David, I know of no event where 11,000 people were murdered and 250,000 imprisoned during the liberation of either Aleppo or Ghouta. Yes, many were murdered by your head chopper friends during their reign and many imprisoned. Liberation has enabled exposure of the prisons and mass graves. It has enabled the residents of these areas to tell their own stories and reveal what they had to go through. Yet you are completely silent about what you head chopper friends have done and instead refer to a (mythical) event for which you provide no evidence. You should know by now, David, my positions are usually based on evidence and I do wish to see evidence when charges like yours are made. Evidence I can consider. You can see from my post how the FUKUS regimes charges that the “animal” Assad was committing war crimes by operating a chemical weapons industry just does not stand up to scrutiny. In fact the FUKUS regime leaders, Macron, May and Trump must have known there were no chemical weapons or manufacture at the research station. They lied to everyone – you and me as well. Yet you do not question those lies – why is that? I looked at the previous allegation of a chemical weapons attack in Khan Shaykhun last year and concluded the evidence did not support the politically motivated conclusions of the JIM team – see Chemical weapons use in Syria UN report flawed by political bias. That is, my position was based one evidence – not group thinking or blindless acceptance of what lying politicians have been telling us. Similarly, my reaction to the Douma “chemical weapons attack” was to refuse to accept the media and political claims, to ask for the evidence and in the meantime not commit myself. At least in this case the OPCW has been able to get access (your head chopper friends never allowed access during previous investigations). There is an atmosphere of extreme pressure which means that their report will be rejected by the regimes in Paris, London and Washington unless it supports their claims. My current interpretation of this event is that is was manufactured. But that is based solely on the testimony of the doctors at one site. We still have to see some evidence from the site where the White Helmets filmed courses. I have seen reports the investigators accessed this site and collected samples – but that has not been officially confirmed. Now, the fact is, David, your mainstream media has made claims that are not supported by the evidence (and very often proven to be fake) on most things to do with the Syrian war. You accept these claims for ideological reasons and you refuse to even consider, let alone discuss, the obvious lies being told by the politicians and media (for example about the research centre that was destroyed by the attack of the FUKUS regimes). David, it is not hard to look beneath the fake news and false claims of the mainstream media and its political masters. You just need an open mind and willingness to tear of the blinkers you are wearing. That is why I consider my latest post (Mainstream media-political alliance gets vindictive) on the poltical attacks being made by the mainstream media and governments on alternative media sources and those discussing information objectively as very important. This analysis also shows how mainstream media journalists are simply acting as stenographers – uncritically passing on the lies of governments without doing the normal checking we should expect of journalists. Why not raise your objections to my analysis there (after all you are carefully avoiding discussion of the content of this post). And, please, stop your use of unsupported numbers which mean nothing. Actually consider the evidence in that post. Ken, you don’t seem to get it. I have a lot of questions about the chemical weapons attack. First, I thought it was very odd that Assad would gas his own people immediately after the United States said it would withdraw from Syria. Why would he do that? It would only force the U.S. to stay. I asked exactly the same question prior to the U.S. invasion of Iraq. Why would Saddam Hussein have anything to do with 911? He had everything to lose. No one else seemed to be asking that question at the time. You still don’t get it. You’ll get no argument from me about the chemical weapons attack. There are a lot of unanswered questions. Why do you continue to argue something that I don’t disagree with you about? Your arguments are nothing more than a diversion. Show me where I have ever tried to defend those airstrikes? Would it be alright if the government of New Zealand did this to its own citizens? Would it be alright if the United States did this to its own citizens? Then why is it ok if Assad does it to his own citizens? Silence in the face of an atrocity is no more than approval of the crime, and for 5 times now, you have approved of these crimes against humanity with your silence. David, I do not put up my posts just for you. I will continue to argue for things becuase I think there is a need. And there is still a need for you. Arguments based on perceived motives are not worth much. For example, Trump may wish to get out of Syria but the people around him think otherwise – and one could argue that is the reason for the false flag “chemical attack” in Duoma. But the point of my article was to present the evidence which shows the regimes in Paris, UK and Washington are lying. They know there are no chemical weapons at the targets they choose. Their advisors surely keep them up to date with OPCW reports. Further – if the mainstream media was doing its job, if their journalists behaved like real journalists instead of stenographers, then the facts would come out. The journalists would be pressuring those regimes for answers. But, no. The mainstream media treats us like mushrooms – happy to repeat lies from these regimes. That is the real issue. Your refusal to face up to the way these media and regimes lie and to actually critically examine claims is the real problem. I cannot expect you to adopt a more objective approach but you should reflect on the fact that you are attacking me for doing os. Where is the morality in that? Regarding the photographic exhibition you are promoting, David. Have you checked out the background? The organisations running this? Can you find any evidence that these images are credibility what these people claim they are? After all the organisations behind this are intimately connected with terrorist groups in Syria (which, I guess means they have a vast field of tortured and murdered people they can photograph). Pardon the pun but I see this exhibition as overkill – shocking images with nothing to provide any credibility to the claims surrounding them. It would be better if such people concentrated on specific cases, specific examples.It would be much easier to ascertain the credibility in that case. It is easy to hide political motivations, facts and lies behind such unauthenticated shocking images and claims. The regimes in London, Washington and Paris use this =tactice all the time to demonise Syria and its president. The justification of those regimes for their unlawful missile attack is such an example. Completely devoid of any facts but full of unauthenticated claims. So now your story is that when you present a post on your blog, the discussion below never evolves into something beyond the original post? Is that what you are saying? There has never been one instance in which you have never gone beyond the scope of your original post in the comments? That’s a damned lie. One only need look at the comments of your blog to see how far afield the comments, in which you have freely engaged, have strayed. How many examples would you like me to present? Face it, Ken, or admit it, you don’t want to discuss the atrocities in these pictures ( https://humanpains.com/tag/eyes-gouged-out/ ) for political and ideological. You are unable to criticize the Assad regime for its crimes against humanity . . brutal torture, which you refuse to discuss. You don’t think there is a need to argue against brutal crimes against humanity. This is your quote: “I have never justified any crime against humanity – in fact, I have for a long time been fighting such crimes.” That is a lie. Your silence . . your inability to even discuss the crimes speaks volumes about your political ideology. Your silence in the face of this barbarous atrocity, tells us who you are. Your silence is deafening. David, I am not directing where you post your comments – just suggesting as my most recent post is extremely relevant to the discussion that would be the place for comments. I am happy to discuss the “atrocities in your pictures” if you can provide some validation. The little searching I did showed links to terrorist groups operating in Syria. I would not take your photos as any more credible than those of the Shite Helmets and the Syrian-Amercian Medical Society. Both propaganda organs for the terrorists. You produce something authenticated, not unreliable from terrorist sources, and I am happy to look at it. You lie. I, in fact, do argue against brutal crimes against humanity. That is why I have argued strongly against the head choppers in Syria that you seem to want to excuse. I think it is criminal the way our mainstream media demonises the Syrian authorities, without evidence, but continues to ignore what these head choppers have been doing. It is incredible to me that our media talks about the “fall” of Aleppo and Ghouta instead of their liberation. So enough of these silly attacks. Find some evidence for the charges you are making instead of relying on propaganda from the terrorists. Then we can have a discussion. Here you go: “Human Rights Watch says it is confident photos smuggled out of Syria by a defector in 2013 showing 6,786 people who died after detention are authentic. “The group carried out a nine-month investigation into the 53,000 images handed to the opposition by a military police photographer, codenamed Caesar. “But on Wednesday, Human Rights Watch laid out in a new report what it said was new evidence regarding the authenticity of the Caesar photographs, identifying a number of the victims and highlighting some of the key causes of death. “One important development came last month when the FBI’s Digital Evidence Laboratory issued a long-awaited analysis of a subset of the photos, writing in a report that “the bodies and scenes depicted…exhibit no artifacts or inconsistencies that would indicate that they have been manipulated.” The report, dated June 12, 2015, was compiled by the Operational Technology Division’s Forensic Audio, Video and Image Analysis Unit . . .
Ken, Question: How many interviews have you conducted with Caesar to reach the conclusion that these photos are fake, from some terrorist organization? Question: How many witness to these crimes have you interviewed? Question: How many of the photos have you analyzed, what methodology was used, and how have you determined that the FBI’s analysis is invalid? Unless you can answer those questions, as you said, you should be happy to discuss the atrocities in those pictures. Show me I lied. Argue against the brutal crimes which have been documented in these photos, prove to me they’re fakes, or admit I didn’t lie. Unless you can show me that reports from the FBI, Human Rights Watch, or Amnesty International are “propaganda from the terrorists,” you should be ready to discuss the atrocities in these photos, as you said you would be. This is the official Human Rights Watch report on the Caesar photographs. Please, take your time and read it. Then read it a second time. The report authenticates the photographs, it is not unreliable from a terrorist source; therefore, as you said, you should be happy to look at it. What struck me most were descriptions of the conditions in which the victims were held prior to death. These conditions were no better, and in some cases worse, than conditions in German concentration camps. The descriptions were eerily reminiscent of holocaust survivors. This is the Syrian government “liberating” its people. David, I do not see HRW as a credible source regarding Syria – others have commented that Roth and his wife have an obsession with that country and she has campaigned against WHO because medical assistance has been sent into liberated areas of Syria (She believes assistance should only be sent to areas controlled by the head choppers – and we now have the incredible situatioin that areas like Aleppo and Ghouta once liberated reveal medical facilties – usually restricted to Jihadi fighter use – have better medical equipment than is generally available in free Syria because of the economic blockade). Actually, I would campaign against WHO too – but from a different direction – because of the way they uncritically picked up the claim of 500 victims of the “chemical incident” in Douma. Perhaps Annie Sparrow’s attacks on WHO had a purpose and achieved something. On this issue, HRW does have links with terrorist organisations operating in Syria – and a simple search of the organisations behind this photographic exhibition reveals the presence of those groups. I do not question the existence of the photos – just that one cannot rely on the testimony of these people anymore that we can rely on the testimony of the White Helmets or the Syrian – American Medical Society (which I believe Roth’s wife Annie Sparrow belongs to). I have yet to read the HRW report (I think I have come across it before anyway) but if it is what I think it is the critcism I have seen is that it relies on testimony and research that is not from people on the ground – rather like the JIM team did) but at this stage I do not see any authentication that the description of the photos is any more accurate than the description of the videos of the Douma (most probably fake or false flag) chemcal incident promoted by the White Helmets and SAMS. These also have the undying support of the FUKUS regimes – despite all the expose coming out that they are fake. In these cases, I also do not question the existence of the videos – but the current evidence coming out shows they do not support what these terrorist groups and their publicity machine (and the FUKUS regimes) claim. The FBI analysis that most of the photos appear to be real is, of course, irrelevant – they do not authenticate the claims made by the organisations promoting them. Your question about me interviewing someone claimed to be called “Ceaser” is just stupid. He may not even be a real person. Do you know who he is? At this stage all I can repeat is that I have no problems accepting that some human rights violations have occurred in Syria – as they have in many countries (especially in the middle east), including the USA. I just question the apparent amplification of such incidents to the extent that people and organisations working with and associated with the terrorists have done. Especially as they do not look at the human rights violations committed by their head chopper friends – and evidence for those are not hard to find. From filmed executions, slave markets, prisoners in Douma transported around in cages on the back of pickups, and the prisons, torture chambers and mass graves that have been revealed after the liberation of these territories. (On this aspect – can you point me to any detailed report from HRW on the human rights violations committed under the jihadis in areas like Idlib, Aleppo and Gouta? 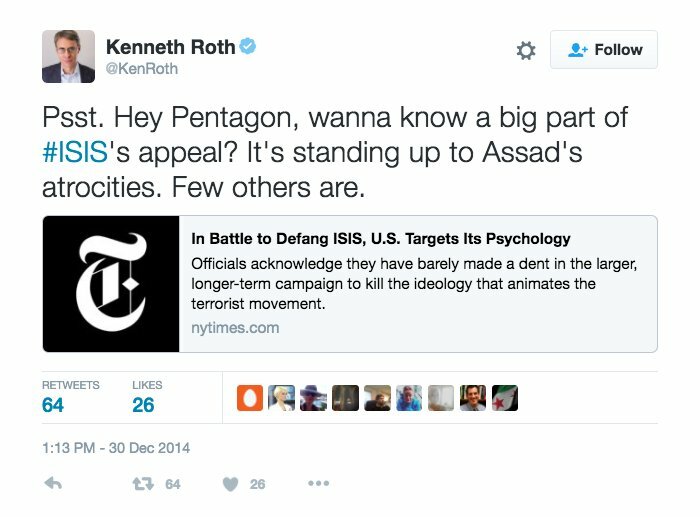 I haven’t seen anything myself – on the other hand, I have actually seen a tweet from Roth effectively supporting ISIS becuase they fight against the legitimate Syrian government). It’s easy to take some real incidents (such as you did with the boys arrested and tortured for doing graffiti), amplify them beyond reason and remain silent on the very clear evidence of atrocities committed by the people you support. Your response is obviously premature. I will take it as such. I get that. So when you say incorrect things like, “it relies on testimony and research that is not from people on the ground,” I understand that your comment is supported by ignorance. You have wasted your time and mine by making it. You are talking about a chain-of-custody. You are not talking about the origin of the photographs. These are two different things, and you should know that. You know what chain-of-custody is, right? Would you have felt better if Caesar had chosen to smuggle the photos out via the Russian Embassy? Yeah, that would have been a great idea. So, the reason for my stupid question ‘Have you interviewed Caesar?’ is that you have immediately dismissed Caesar, even though you haven’t interviewed him. You admit you don’t even know if he is a real person. Yet an international team of forensic experts and lawyers spent days interviewing him (Was this international team of professionals working with the head-choppers also?). Those who spent time in his presence, those who did examine him, did find him to be credible. The reason I asked the question was to highlight the ignorance supporting your dismissive reaction. I hope this helps clear things up. Response: You accept the photos are real, and you diminish their significance by comparing them to occurrences in the U.S.? Torture of this magnitude is not acceptable in the United States. It would not be acceptable in New Zealand. And it is not acceptable in Syria. It is considered a Crime Against Humanity. Since you haven’t yet read the HRW report, I accept your comments for what they are: Uninformed, but forgivable. I won’t say, yet, that your biased comments are a spit in the face of every victim, mentioned in this report, who died an unimaginable death. David, significantly you missed out from your quote ” but if it is what I think it is ” – I was clearly referring to a previous report which sounds to be the same or similar. I suspect the report you refer to is the same one (one that is widely criticised for being based on hearsay with no direct evidence) – but we will see. I have yet to read it – perhaps you can tell me if it contains any on-the-ground evidence (a quick glance through indicates to me that at least some of the evidence is hearsay). Considering how the White Helmet/SAMS reports and claims about the Douma incident is currently falling apart you must see why I maintain these things must be assessed critically. These propaganda organisations have testimony from a young girl and a “doctor” – claimed to be in Douma but who had left with the jihadis when they surrendered. I do not think their testimony compares in value with the 17 Douma patients and doctors currently giving evidence in the Hague (but whose testimony will, of course, be rejected by the stenographers for the mainstream media. That process has already started). You are wrong – I do not refer at all the “chain of custody” I refer to the organisations behind the exhibition you are promoting. They are linked to jihad groups or operate as propaganda and political organs for the jihadis in the same way the White Helmets and the SAMS do. No – I do not immediately dismiss “Ceaser” – but I do question if he is real. No name! But thanks for the report to the UN – I will read that. As you know I do not take reports as evidence or facts – even UN one. Rember how I analysed the JIM report – Chemical weapons use in Syria UN report flawed by political bias and found it politically biased. Remember how I analysed the MH17 JIT report and determined it would not stand up in court (I am even more convinced of this with the recent radar information and the fact that no one as yet has checked out the BUK units possessed by the Ukrainian army and the rebels that were in the region at the time) – But will it stand up in court?. Remember how I analysed the McLaren doping report and found it uncov=nving and biased – https://openparachute.wordpress.com/2016/08/07/34384/. The Court of Arbitration for Sport has just passed judgment and found McLaren’s report faulty, and his reliance on the fake testimony of a criminal not supported (see the Arbitral Award). I in no way diminished the photos – I was simply saying I have never claimed any state in the Middle east, or elsewhere including especially the USA, was not guilty of crimes against humanity. My position has always been the situation with the elected and legitimate government and the existing state structures in Syria is infinitely preferable to the alternative of regime change which would put the head choppers in control. We have only to look at Lybia to see what the NATO regime change scenario will lead to. My position has always been that the Syrian people should determine their own leaders and future. This is the UNSC position and the approach that the Russian Federation and Iran are taking. Turkey to some extent. And the Syrian government which participates willingly in the negotiations in Geneva and Asta. But the FUKUS regimes have acted illegally – they are, in effect, working against the UNSC resolutions on Syria. The question of acceptability is not an issue. These things (the photo contents) happen in various countries and we should always condemn them. But, I am strongly suspicious of you ignoring my request for evidence the Roth and Sparrow have ever campaigned against the atrocities of the head choppers in Syria. There is absolutely no question of those atrocities, The evidence is direct from Syria (not hearsay from people outside Syria) and in very many cases there are videos showing the torture, murders and decapitation of Syrian victims in process. I am always suspicious of arguments based on evidence from the head choppers or their associated media and political organisations. There is just so much of it in the media these days and the plight of people in the areas controlled by the terrorists or besieged by them is always ignored (by the mainstream media). As is the evidence of the normality of a secular and free life in places like Damascus and how this is returning to the liberated areas. And now we have the mainstream media going out of its way to attempt to discredit the testimony of the doctors and patients from Douma (if they report it at all). This is disgusting. David, do you have a link to the decision of the UNSC regarding the letter from the French ambassador? Save me searching for it. No, I’m afraid not. Resolution 2139 was mentioned in the HRW Report in which it was emphasized that the U.N. follow up on its own resolution. Human rights violations on both sides were condemned, and unfettered access for humanitarian aid was demanded. The vote was unanimous. Ok, You are talking about promotion of these photographs. You are not talking about the origin of the photographs. These are two different things, and you should know that. As for your comment about crimes against humanity committed by other countries, you’ll get no argument from me . . but I will not engage in a game of “whataboutism” in order pacify your need to the justify torture of tens of thousands of Syrian citizens by its own government. That link is not correct, David, as it refers to a 2011 vote, while the French Ambassadors letter is from 2014. But I ask because it is one thing to produce a report and another thing for it to be accepted by the UNSC. If it is not accepted then it is completely misleading to pretend the report has the backing of the UN. This is an important issue because the work of the UN is full of politically motivated things. The same observation also applies tot he OPCW as the recent joint statement of NATO-aligned representatives shows. This is exactly the case with the 2017 JIM report on chemical weapons I wrote about in my article Chemical weapons use in Syria UN report flawed by political bias. This was a biased, shonky, unprofessional report which was rightly rejected by the UNSC. This poor quality report is the reason why the mandate of the JIM groups has not been renewed, and will not be renewed without it adopted better working methods – like sending investigation teams to take their own samples on-the-ground instead of relying on those from the jihadi groups and using social media. Simply pretending these reports have the authority of the UN is misleading – we need to adopt a more critical and intelligent approach. “critical and intelligent approach” . . Coming from someone who still hasn’t read the HRW report on the Caesar photos, . . The Caesar photos, which I believe was the subject of Araud’s report. David, part of being intelligent and critical is to actually read documents and look at the related evidence before coming to a conclusion. Or do you think I should just rely on a “fact-checking” site, that I should give up any thinking for myself? You know thta is not how I work. I believe you have given me all the information you have on this so just leave me to analyse things for myself – it is not as if it is the only thing on my plate, nor is it the most urgent (after all it is crude “whataboutism”) but I will get around to it. Thank you for agreeing with me. After you have read the HRW report and have looked at the related evidence regarding the Caesar photos, then I will consider whatever conclusion you you may have reached. Until then, your comments are neither critical nor intelligent. No, David, my comments on the document itself are practically nonexistent (I only mentioned glancing through it) – how could they be otherwise?. However, my comments on Roth and his wife are based on critical and intelligent assessments. But that does open up a wide field of the increasing politicisation of humanitarian and aid groups. “That link is not correct, David, as it refers to a 2011 vote, while the French Ambassadors letter is from 2014. I double-checked the dates and you’re right. Good catch. From the article: “The informal council meeting was organized by France to give the 15 member states a chance to see some of the 55,000 photographs that former war crimes prosecutors have described as “clear evidence” of systematic torture and mass killings in Syria’s three-year-long civil war. But you are correct. I don’t think anything formal came of it.